Уколико имате слободног времена у току седмице јавите се оцу Александру електронском поштом на fatheraco@stsavaboston.org . Од сада па до јесени, око цркве увек има физички нешто да се ради и ваших неколико сати добровољног рада ће добро доћи. 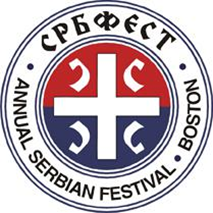 If you have any free time and are willing to help around church, please contact father Aleksandar at fatheraco@stsavaboston.org . There are plenty of chores that need to be done until fall, and your help is greatly appreciated. Овај свети Сабор је одржан у граду Никеји, у области Витинији у Малој Азији, 325. године у време Светог цара Константина Великог (305-337. год.). 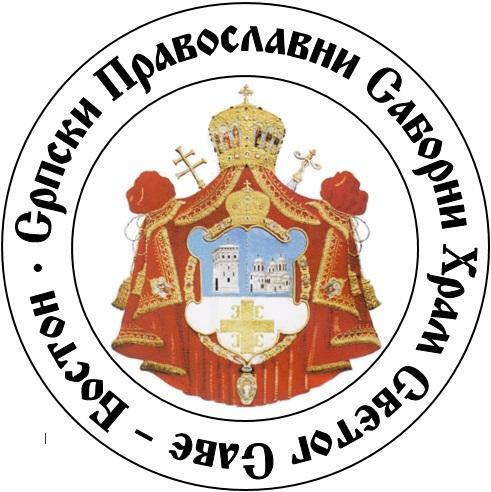 Овај Сабор беше сазван да отклони забуну, коју својим кривим учењем створио беше Арије, свештеник александријски. Он је, наиме, распростирао учење као да Господ Христос, Син Божји, није прави Бог, него да је у времену створен од Бога, те према томе није превечни Син Божји, раван по суштини и бићу Богу Оцу. Због оваквог Аријевог учења њега је најпре осудио његов епископ, Свети Александар Александријски (и то два пута: 319. и 323. године на саборима у Александрији), али то Арије није послушао, него је чак покренуо неке своје пријатеље и једномишљенике епископе да поведу борбу против Светог Александра и Православља које је он заступао. Чувши за тај спор, цар Константин упути у Александрију старог и искусног епископа Осију, из града Кордубе у Шпанији, али како ни тада није дошло до мира у Цркви свети цар сазове све епископе у град Никеју месеца маја 325. године. On the seventh Sunday of Pascha, we commemorate the holy God-bearing Fathers of the First Ecumenical Council. The Commemoration of the First Ecumenical Council has been celebrated by the Church of Christ from ancient times. The Lord Jesus Christ left the Church a great promise, “I will build My Church, and the gates of hell shall not prevail against it” (Mt. 16:18). Although the Church of Christ on earth will pass through difficult struggles with the Enemy of salvation, it will emerge victorious. The holy martyrs bore witness to the truth of the Savior’s words, enduring suffering and death for confessing Christ, but the persecutor’s sword is shattered by the Cross of Christ. Persecution of Christians ceased during the fourth century, but heresies arose within the Church itself. One of the most pernicious of these heresies was Arianism. Arius, a priest of Alexandria, was a man of immense pride and ambition. In denying the divine nature of Jesus Christ and His equality with God the Father, Arius falsely taught that the Savior is not consubstantial with the Father, but is only a created being. A local Council, convened with Patriarch Alexander of Alexandria presiding, condemned the false teachings of Arius. However, Arius would not submit to the authority of the Church. He wrote to many bishops, denouncing the decrees of the local Council. He spread his false teaching throughout the East, receiving support from certain Eastern bishops. Investigating these dissentions, the holy emperor Constantine (May 21) consulted Bishop Hosius of Cordova (Aug. 27), who assured him that the heresy of Arius was directed against the most fundamental dogma of Christ’s Church, and so he decided to convene an Ecumenical Council. In the year 325, 318 bishops representing Christian Churches from various lands gathered together at Nicea. Among the assembled bishops were many confessors who had suffered during the persecutions, and who bore the marks of torture upon their bodies. Also participating in the Council were several great luminaries of the Church: Saint Nicholas, Archbishop of Myra in Lycia (December 6 and May 9), Saint Spyridon, Bishop of Tremithos (December 12), and others venerated by the Church as holy Fathers. Arius, with seventeen bishops among his supporters, remained arrogant, but his teaching was repudiated and he was excommunicated from the Church. In his speech, the holy deacon Athanasius conclusively refuted the blasphemous opinions of Arius. The heresiarch Arius is depicted in iconography sitting on Satan’s knees, or in the mouth of the Beast of the Deep (Rev. 13). The Fathers of the Council declined to accept a Symbol of Faith (Creed) proposed by the Arians. Instead, they affirmed the Orthodox Symbol of Faith. Saint Constantine asked the Council to insert into the text of the Symbol of Faith the word “consubstantial,” which he had heard in the speeches of the bishops. 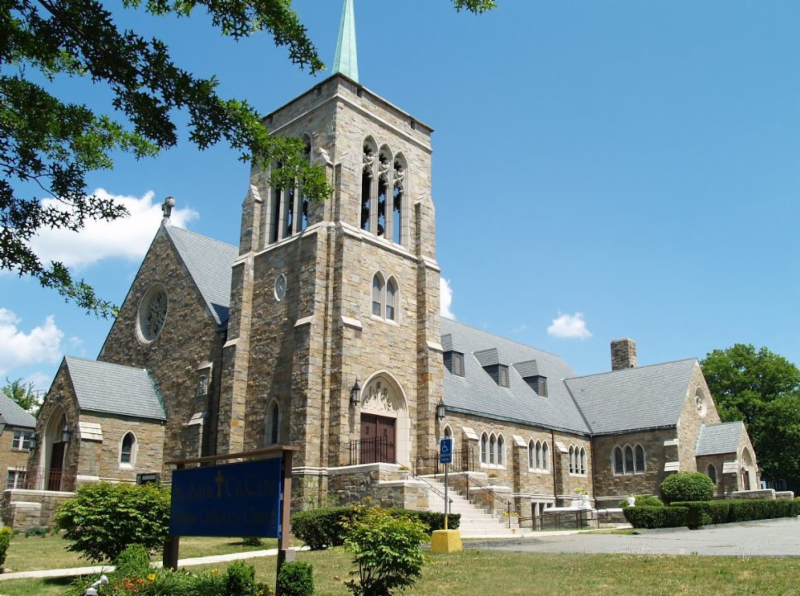 The Fathers of the Council unanimously accepted this suggestion. 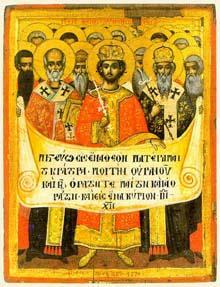 In the Nicean Creed, the holy Fathers set forth and confirmed the Apostolic teachings about Christ’s divine nature. The heresy of Arius was exposed and repudiated as an error of haughty reason. After resolving this chief dogmatic question, the Council also issued Twelve Canons on questions of churchly administration and discipline. Also decided was the date for the celebration of Holy Pascha. By decision of the Council, Holy Pascha should not be celebrated by Christians on the same day with the Jewish Passover, but on the first Sunday after the first full moon of the vernal equinox (which occured on March 22 in 325). The First Ecumenical Council is also commemorated on May 29.